The Saint Thomas Church Choir of Men and Boys is a magnificent choir; the Orchestra of Saint Luke’s, consistently fine, playing with the choir in their March 2016 concert, was first-rate. A concert of sacred laments with works by Elizabethan composer John Taverner (c.1490-1545), two pieces by Sir John Tavener (b. 1944) and one by James MacMillan (b. 1959) was uneven: the difficult, unsuccessfully performed Tavener The Last Discourse was a surprising contrast to the beautiful presentations of the other three pieces. The concert opened with Taverner’s exquisite a cappella choral work, Quemadmodum. 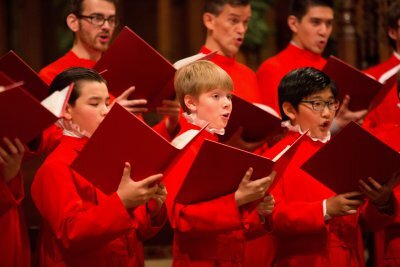 This short – five minute – setting of the poignant psalm “As the hart pants after water brooks” presents longing in dense cascades of sound: the boys’ sweet, ethereal voices foreshadowed the anguish of longing for peace and rest that Jesus experienced in the last two pieces of the concert. The second piece was Sir John Tavener’s 1995 Syvati, a Russian Orthodox funeral recessional set to a traditional ecclesiastical Slavonic text. In this breathtakingly beautiful work for solo cello and choir, the cello represents the Priest or the Processed Ikon of Christ, chanting in alternation with the choir. The work, melding Anglican and Eastern Orthodox sensibilities, is about both journey and mediation, movement from this world to the next, or another, and the inhabitation of liminality. Cello soloist Myron Lutzke, principal cellist of the Orchestra of St. Luke’s, made his instrument a voice of sacredness, at once human and otherworldly, signaling the mourners, boys and men alike, to follow grief to its resolution in rest. The basses provided a continuo of earth and sadness; the boys’ evocation of angelic welcome shimmered. It was a remarkable and wonderful performance. The auspicious beginning of the first two pieces made Tavener’s The Last Discourse all the more disappointing. Tavener’s text consists of short passages of some of Jesus’ final words before his trial and execution. The words are sung by the choir, by a soprano soloist and a bass soloist. Soprano Sherezade Panthaki, a virtuosic and accomplished singer active throughout the region, sang from an upper gallery on the left hand side of the long St. Thomas nave. Bass Glenn Miller, a member of the Saint Thomas choir and an active solo artist, sang from the organ loft at the back of the church over the narthex where John Feeney, principal bassist of the Orchestra of Saint Luke’s was playing amplified double bass. From Gabrieli to Langlais, ecclesiastical composers of many centuries have placed singers and instruments in different parts of big churches to experiment with sound and resonance patterns; Tavener’s experiment – originally designed for St. Paul’s Cathedral, London, in 1998 – has a distinguished ancestry. But the acoustics at Saint Thomas simply didn’t work. Panthaki’s ordinarily rich and flexible voice was rendered gratingly tinny and her words were unintelligible. The upper gallery placement of the speakers through which the jarringly amplified double bass was heard was disconcerting, sending out sounds in disorganized directions above the audience; Miller’s words were almost as impossible to understand as Panthaki’s. Apparently simply because of their placement in the church, Panthaki and Miller were made unable to perform with their usual excellence. This failure, in spite of the orchestra and the choir’s best efforts, compromised their performance as well. The last piece of the concert was James MacMillan’s substantive and moving 1994 Seven Last Words from the Cross, a 35 minute piece of seven different movements, varying in length from nine to one-and-a-half minutes each, for choir and orchestra. As the piece progresses through the final Passion drama, from Jesus’ plea for forgiveness for his executioners to his exhausted last breath, MacMillan explores aspects of prayer and petition, anguish and fear – Jesus’ and humanity’s – in music that bears close allegiance to Romantic liturgies and Requiems. Here, the Choir and the orchestra were elegant, boys and men singing with superb control, lush expressivity … and their usual clear diction. As Saint Thomas’ rector, the Reverend Canon Carl F. Turner noted in his greetings before the music began, the evening’s guest conductor David Hill has a long and productive association with Saint Thomas: friend and colleague of John Scott, Saint Thomas’ music director whose death last summer was so sudden and unexpected, Hill conducted the Taverner Quemadmodum, the Tavener Syvati and the MacMillan Seven Last Words sensitively and authoritatively. In spite of the mistakes associated with the Tavener Last Discourse, this was a good evening, showcasing a brilliant and eloquent choir. A daring and elegant collective of contemporary choral composers and conductors, no longer “new,” now well established, presents an evening of gorgeous music. A little known Baroque chamber opera of uneven merit, charmingly and happily presented. A beautiful performance of two familiar 18th century sacred choral masterpieces, and a fitting memorial to a much loved church musician, deeply mourned. The elegant and splendid best of Anglican choral music.